I love to bake from scratch, but sometimes there just isn’t enough time in a day. I always have a stock pile of cake mixes in the pantry, and I love to doctor them up and make them my own. 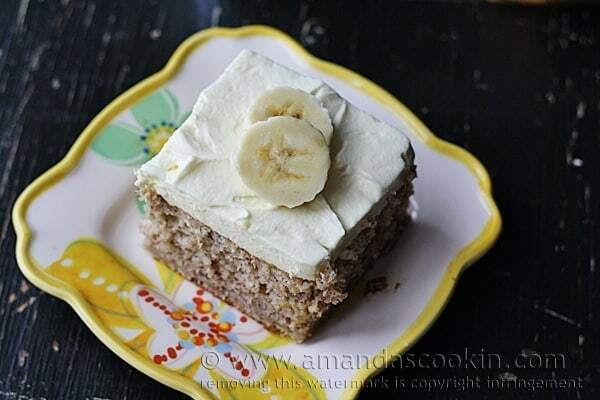 Banana cake is one of my favorite treats, and I have a few different recipes here on the blog that I like to make. 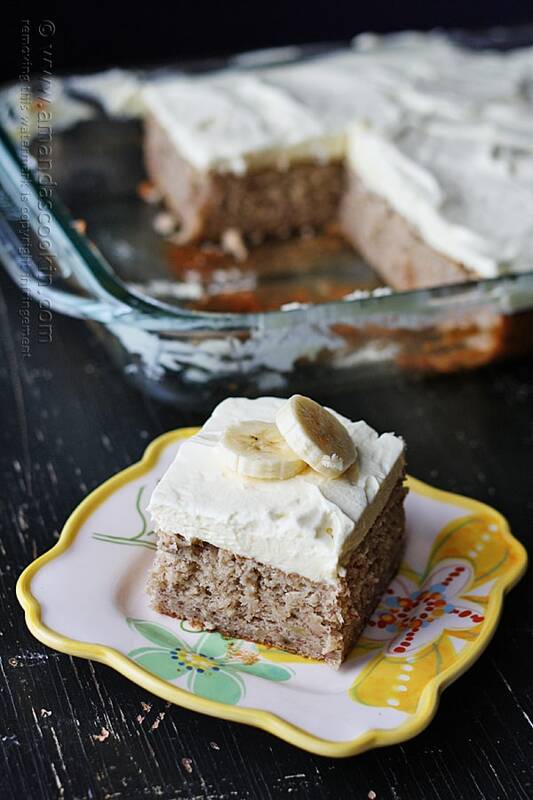 But this banana cake using cake mix is faster and still uber delicious! I really like to be in the kitchen, you can tell that from the posts in my Instagram feed. I love to bake, make cookies, cake, brownies etc. But… not sure how many readers of this blog know that I’m also a very busy crafter, you can see some of that on my craft blog – Crafts by Amanda. It’s also apparent on my Instagram feed. I also do quite a bit of freelance work. I create crafts for General Mills via their Kix Cereal brand, like these cute mitten puppets that my awesome son is wearing. I also make kid’s crafts for Disney’s Spoonful where I post 8 times per month! If that wasn’t enough, I also recently completed two kid’s craft books that will be available this fall, and am currently working on the 3rd and 4th books in the series. On top of all that, I make crafts and recipes for the awesome websites of Prime Publishing. So needless to say, I don’t get into the kitchen as often as I would like! That’s why doctoring up a cake mix can be a real time saver for me. I love to bake from scratch, but I don’t always have the time to do that. 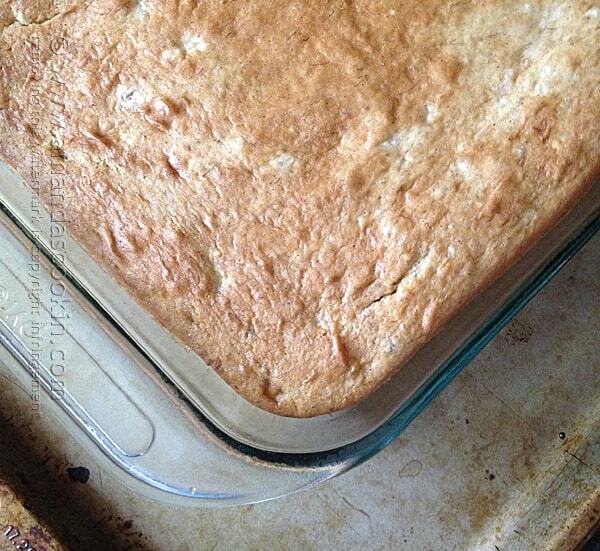 This particular doctored cake mix recipe is one of my favorites to date. 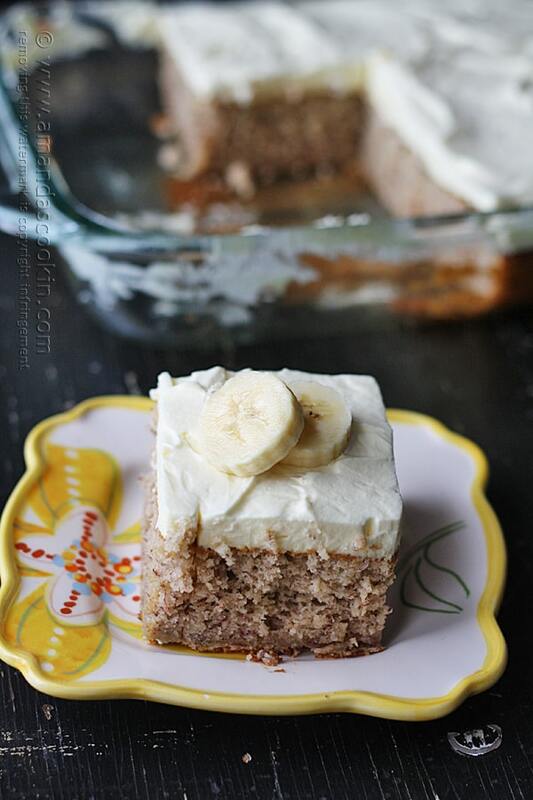 I’ve added some tasty spices and yummy ripe bananas, then topped it with some banana flavored whipped cream frosting. 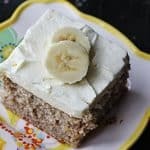 This banana cake using cake mix is positively delicious, easy to make and is topped with an amazing banana flavored whipped cream frosting! Preheat oven to 350 F. Grease a 13x9 baking pan. 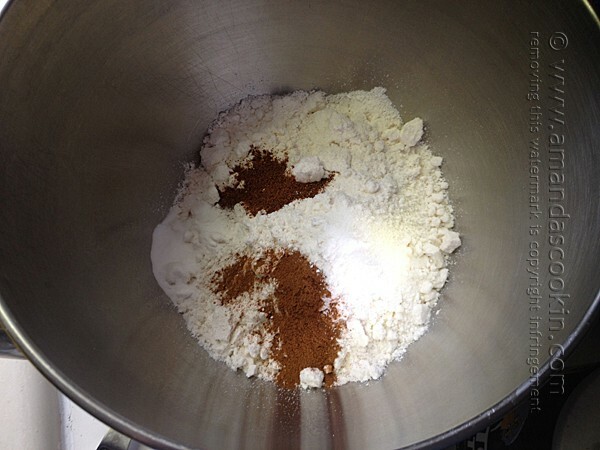 In a large mixing bowl, whisk together dry cake mix, cinnamon, nutmeg, baking soda and salt. 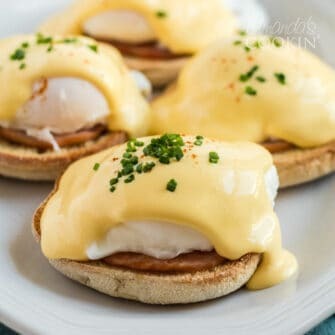 Use milk in place of the water on the back of the cake mix box and use whole eggs instead of egg whites. Use oil as directed on box. 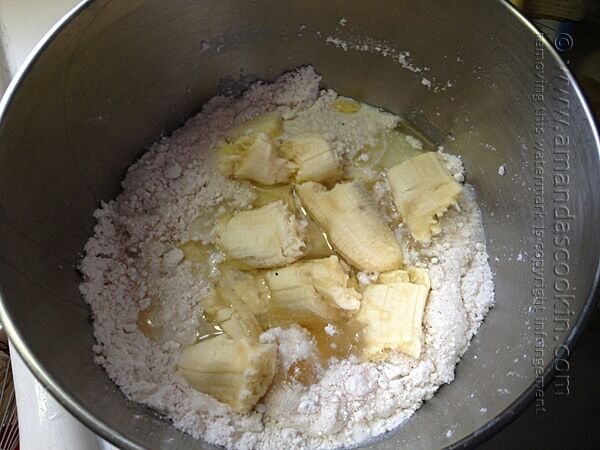 Add milk, eggs, oil and bananas to the mixing bowl. NOTE: Some white cake mixes have two versions, one with egg whites and one with whole eggs. If yours has this option, use the number of eggs called for in the whole-egg version. Beat on low for 15-30 second to combine then increase speed to medium high and beat for two minutes, until well blended. Pour batter into prepared cake pan and bake in preheated oven for 40-45 minutes or until cake springs back when gently touched in the center. 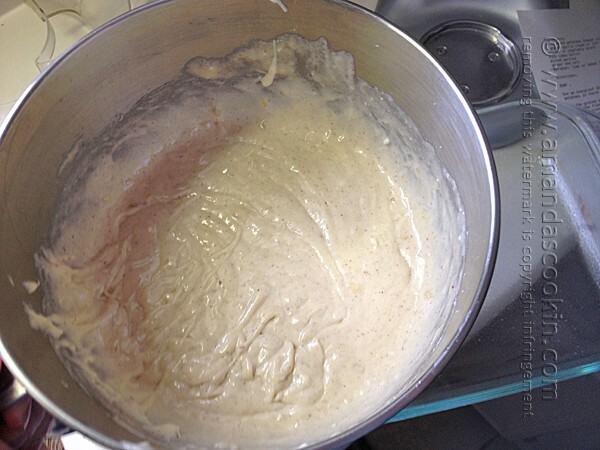 In a medium bowl, whisk together milk and pudding and place in refrigerator. Beat the whipped topping in a mixer on high until stiff peaks form. Fold pudding into the whipped cream and spread onto cake. Doesn’t it keep it’s moist texture if you refrigtrate it .